Niccolò Machiavelli (May 3, 1469 – June 21, 1527) was an Italian political philosopher, historian, musician, poet, and romantic comedic playwright. Machiavelli was also a key figure in realist political theory, crucial to European statecraft during the Renaissance. It ought to be remembered that there is nothing more difficult to take in hand, more perilous to conduct, or more uncertain in its success, than to take the lead in the introduction of a new order of things. It is better to be loved rather than feared, or feared rather than loved? It might perhaps be answered that we should wish to be both: but since love and fear can hardly exist together, if we must choose between them, it is far safer to be feared than loved. Friendships that are won by awards, and not by greatness and nobility of soul, although deserved, yet are not real, and cannot be depended upon in time of adversity. The prince must consider, as has been in part said before, how to avoid those things which will make him hated or contemptible … when neither their property nor honour is touched, the majority of men live content, and he has only to contend with the ambition of a few, whom he can curb with ease in many ways. When evening comes, I return home and enter my study; on the threshold I take off my workday clothes, covered with mud and dirt, and put on the garments of court and palace. Fitted out appropriately, I step inside the venerable courts of the ancients, where, solicitously received by them, I nourish myself on that food that alone is mine and for which I was born; where I am unashamed to converse with them and to question them about the motives for their actions, and they, out of their human kindness, answer me. And for four hours at a time I feel no boredom, I forget all my troubles, I do not dread poverty, and I am not terrified by death. I absorb myself into them completely. Now, in order to execute a political commission well, it is necessary to know the character of the prince and those who sway his counsels; ... but it is above all things necessary to make himself esteemed, which he will do if he so regulates his actions and conversation that he shall be thought a man of honour, liberal, and sincere. The latter point is highly essential, though too much neglected, as I have seen more than one so lose themselves in the opinion of princes by their duplicity, that they have been unable to conduct a negotiation of the most trifling importance. It is undoubtedly necessary for the ambassador occasionally to mask his game; but it should be done so as not to awaken suspicion and he ought also to be prepared with an answer in case of discovery. "Instructions given by Niccolo Machiavelli to Rafael Girolami, Ambassador to the Emperor," The History of Florence and of the Affairs of Italy: From the Earliest Times to the Death of Lorenzo the Magnificent; Together with The Prince, and Various Historical Tracts, H.G. Bohn, Editor, p.505–06 (1854). The highlighted passage is often misquoted or paraphrased out of context, as in Arthur Koestler's Darkness At Noon (1941): Occasionally words must serve to veil the facts. But let this happen in such a way that no one become aware of it; or, if it should be noticed, excuses must be at hand to be produced immediately. 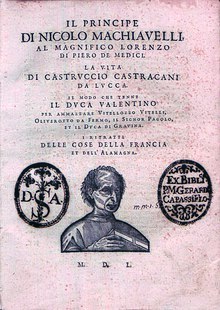 Original Italian title: Il Principe. Full text. A cognoscer bene la natura de' popoli bisogna esser Principe, ed a cognoscer bene quella de' Principi conviene essere popolare. To understand the nature of the people it needs to be a prince, and to understand that of princes it needs to be of the people. Ch. 3; Variant translation: Never do any enemy a small injury for they are like a snake which is half beaten and it will strike back the first chance it gets. Il tempo si caccia innanzi ogni cosa, e può condurre seco bene come male, male come bene. Time drives everything before it, and is able to bring with it good as well as evil, and evil as well as good. Ch. 3 (as translated by RM Adams). Variants [these can seem to generalize the circumstances in ways that the translation above does not. ]: The Romans, foreseeing troubles, dealt with them at once, and, even to avoid a war, would not let them come to a head, for they knew that war is not to be avoided, but is only put off to the advantage of others. Chi crede che ne' personaggi grandi beneficii nuovi faccino dimenticare l'ingiurie vecchie, s'inganna. Chi fonda in sul populo fonda in sul fango. He who builds on the people, builds on the mud. E però un principe savio deve pensare un modo per il quale i suoi cittadini sempre ed in ogni modo e qualità di tempo abbiano bisogno dello Stato di lui, e sempre poi gli saranno fedeli. La natura degli uomini è, così obligarsi per li beneficii che essi fanno, come per quelli che essi ricevono. It is the nature of men to be bound by the benefits they confer as much as by those they receive. Ch. 14; Variant: There can be no proper relation between one who is armed and one who is not. Nor it is reasonable to expect that one who is armed will voluntarily obey one who is not. And therefore a prince who does not understand the art of war, over and above the other misfortunes already mentioned, cannot be respected by his soldiers, nor can he rely on them. He ought never, therefore, to have out of his thoughts this subject of war, and in peace he should addict himself more to its exercise than in war; this he can do in two ways, the one by action, the other by study. Molti si sono immaginate Repubbliche e Principati, che non si sono mai visti nè cognosciuti essere in vero; perchè egli è tanto discosto da come si vive, a come si doveria vivere, che colui che lascia quello che si fa per quello che si doveria fare, impara piuttosto la rovina, che la preservazione sua. Un uomo che voglia fare in tutte le parti professione di buono, conviene che rovini fra tanti che non sono buoni. Ch. 15; Variant: A man who strives after goodness in all his acts is sure to come to ruin, since there are so many men who are not good. È necessario ad un Principe, volendosi mantenere, imparare a potere essere non buono, ed usarlo e non usarlo secondo la necessità. Still, a prince should make himself feared in such a way that if he does not gain love, he at any rate avoids hatred; for fear and the absence of hatred may well go together, and will be always attained by one who abstains from interfering with the property of his citizens and subjects or with their women. And when he is obliged to take the life of any one, to do so when there is a proper justification and manifest reason for it; but above all he must abstain from taking the property of others, for men forget more easily the death of their father than the loss of their patrimony. Then also pretexts for seizing property are never wanting, and one who begins to live by rapine will always find some reason for taking the goods of others, whereas causes for taking life are rarer and more quickly destroyed. How laudable it is for a prince to keep good faith and live with integrity, and not with astuteness, every one knows. Still the experience of our times shows those princes to have done great things who have had little regard for good faith, and have been able by astuteness to confuse men's brains, and who have ultimately overcome those who have made loyalty their foundation. You must know, then, that there are two methods of fighting, the one by law, the other by force: the first method is that of men, the second of beasts; but as the first method is often insufficient, one must have recourse to the second. It is therefore necessary to know well how to use both the beast and the man. This was covertly taught to princes by ancient writers, who relate how Achilles and many others of those princes were given to Chiron the centaur to be brought up, who kept them under his discipline; this system of having for teacher one who was half beast and half man is meant to indicate that a prince must know how to use both natures, and that the one without the other is not durable. A prince being thus obliged to know well how to act as a beast must imitate the fox and the lion, for the lion cannot protect himself from snares, and the fox cannot defend himself from wolves. One must therefore be a fox to recognise snares, and a lion to frighten wolves. Those that wish to be only lions do not understand this. Therefore, a prudent ruler ought not to keep faith when by so doing it would be against his interest, and when the reasons which made him bind himself no longer exist. If men were all good, this precept would not be a good one; but as they are bad, and would not observe their faith with you, so you are not bound to keep faith with them. ...those that have been best able to imitate the fox have succeeded best. But it is necessary to be able to disguise this character well, and to be a great feigner and dissembler. Sono tanto semplici gli uomini, e tanto ubbidiscono alle necessità presenti, che colui che inganna, troverà sempre chi si lascerà ingannare. Variant trans: Everybody sees what you seem, but few know what thou art. Gli stati bene ordinati, e li Principi savi hanno con ogni diligenza pensato di non far cadere in disperazione i grandi e di satisfare al popolo, e tenerlo contento. Well-ordered states and wise princes have taken every care not to drive the nobles to desperation, and to keep the people satisfied and contented, for this is one of the most important objects a prince can have. Si deve notare che l'odio si acquista così mediante le buone opere, come le triste; e però, come io dissi di sopra, volendo un Principe mantenere lo Stato, è spesso forzato a non esser buono. It should be noted that hatred is acquired as much by good works as by bad ones, therefore, as I said before, a prince wishing to keep his state is very often forced to do evil. Queste simili morti, le quali seguitano per deliberazione di un animo deliberato e ostinato, non si possono da' Principi evitare, perchè ciascuno che non si curi di morire, lo può fare. Such-like deaths, which are deliberately inflicted with a resolved and desperate courage, cannot be avoided by princes, because any one who does not fear to die can inflict them. La migliore fortezza che sia, è non essere odiato da' popoli. The best possible fortress is—not to be hated by the people. Ch. 20: 'Are fortresses, and many other things to which princes often resort advantageous or hurtful?' Variant translation: The best fortress which a prince can possess is the affection of his people. Nè creda mai alcuno Stato poter pigliare partiti sicuri... La prudenza consiste in saper cognoscere la qualità degli inconvenienti, e prendere il manco tristo per buono. Never let any Government imagine that it can choose perfectly safe courses... Prudence consists in knowing how to distinguish the character of troubles, and for choice to take the lesser evil. Sono di tre generazioni cervelli; l'uno intende per sè, l'altro intende quanto da altri gli è mostro, il terzo non intende nè sè stesso nè per dimostrazione d'altri. Quel primo è eccellentissimo, il secondo eccellente, il terzo inutile. Ch. 23; Variant: A prince who is not wise himself cannot be wisely counseled. Conchiudo adunque, che, variando la fortuna, e gli uomini stando nei loro modi ostinati, sono felici mentre concordano insieme, e come discordano sono infelici. Io giudico ben questo, che sia meglio essere impetuoso, che rispettivo, perchè la Fortuna è donna; ed è necessario, volendola tener sotto, batterla, ed urtarla; e si vede che la si lascia più vincere da questi che da quelli che freddamente procedono. I conclude, then, that so long as Fortune varies and men stand still, they will prosper while they suit the times, and fail when they do not. But I do feel this: that it is better to be rash than timid, for Fortune is a woman, and the man who wants to hold her down must beat and bully her. We see that she yields more often to men of this stripe than to those who come coldly toward her. Whenever men are not obliged to fight from necessity, they fight from ambition; which is so powerful in human breasts, that it never leaves them no matter to what rank they rise. Anyone who studies present and ancient affairs will easily see how in all cities and all peoples there still exist, and have always existed, the same desires and passions. For as when much superfluous matter has gathered in simple bodies, nature makes repeated efforts to remove and purge it away, thereby promoting the health of these bodies, so likewise as regards that composite body the human race, when every province of the world so teems with inhabitants that they can neither subsist where they are nor remove elsewhere, every region being equally crowded and over-peopled, and when human craft and wickedness have reached their highest pitch, it must needs come about that the world will purge herself in one or another of these three ways, to the end that men, becoming few and contrite, may amend their lives and live with more convenience. Cunning and deceit will every time serve a man better than force to rise from a base condition to great fortune. This return of Republics back to their principles also results from the simple virtue of one man, without depending on any law that excites him to any execution: none the less, they are of such influence and example that good men desire to imitate him, and the wicked are ashamed to lead a life contrary to those examples. It is not titles that make men illustrious, but men who make titles illustrious. Discipline in war counts more than fury. Quello che giova al nimico nuoce a te, e quel che giova a te nuoce al nimico. That which is good for the enemy harms you, and that which is good for you harms the enemy. Non è mai alcuna cosa sì disperata, che non vi sia qualche via da poterne sperare. No circumstance is ever so desperate that one cannot nurture some spark of hope. Le più caritative persone che sieno sono le donne, e le più fastidiose. Chi le scaccia, fugge e fastidii e l'utile; chi le intrattiene, ha l'utile ed e fastidii insieme. Ed è 'l vero che non è el mele sanza le mosche. Women are the most charitable creatures, and the most troublesome. He who shuns women passes up the trouble, but also the benefits. He who puts up with them gains the benefits, but also the trouble. As the saying goes, there's no honey without bees. In terra di ciechi chi vi ha un occhio è signore. El fine si ha a riguardare in tutte le cose. One must never forget to look at the aim of a matter. Sono maggiori li spaventi ch'e mali. Fear of evil is greater than the evil itself. Le cattive compagnie conducono gli uomini alle forche. Bad company will lead a man to the gallows! God and nature have thrown all human fortunes into the midst of mankind; and they are thus attainable rather by rapine than by industry, by wicked actions rather than by good. Comincionsi le guerre quando altri vuole, ma non quando altri vuole si finiscono. Wars begin when you will, but they do not end when you please. Variant translation: Wars are begun at will but not ended at will. When Machiavelli came to the end of his life, he had a vision shortly before giving up the ghost. He saw a small company of poor scoundrels, all in rags, ill-favoured, famished, and, in short, in as bad plight as possible. He was told that these were the inhabitants of paradise, of whom it is written, Beati pauperes, quoniam ipsorum est regnum caelorum. After they withdrew, innumerable serious and majestic personages appeared, who seemed to be sitting in a senate-house and dealing with the most important affairs of state. Among them he saw Plato, Aristotle, Seneca, Plutarch, Tacitus, and others of similar character; but he was told at the same time that those venerable personages, notwithstanding their appearance, were the damned, and the souls rejected by heaven, for Sapientia huius saeculi, inimica est Dei.. After this, he was asked to which of the groups he would choose to belong; he answered that he would much rather be in Hell with those great geniuses, to converse with them about affairs of state, than be condemned to the company of the verminous scoundrels that he had first been shown. This account of Machiavelli's "Dream" was not published until a century after his death, in Etienne Binet's Du salut d'Origene (1629). There is an earlier but more oblique reference in a letter written by Giovambattista Busini in 1549: "Upon falling ill, [Machiavelli] took his usual pills and, becoming weaker as the illness grew worse, told his famous dream to Filippo [Strozzi], Francesco del Nero, Iacopo Nardi and others, and then reluctantly died, telling jokes to the last.". The "Dream" is commonly condensed into a more pithy form, such as "I desire to go to hell, and not to heaven. In the former place I shall enjoy the company of popes, kings, and princes, while in the latter are only beggars, monks, hermits, and apostles". I am not interested in preserving the status quo; I want to overthrow it. My father taught me many things here. He taught me in this room. He taught me: keep your friends close, but your enemies closer. Quote allegedly from The Prince, but not found there textually. With such a name, there is no need for eulogy. We are much beholden to Machiavelli and others, that write what men do, and not what they ought to do. For it is not possible to join serpentine wisdom with the columbine innocency, except men know exactly all the conditions of the serpent; his baseness and going upon his belly, his volubility and lubricity, his envy and sting, and the rest; that is, all forms and natures of evil. For without this, virtue lieth open and unfenced. Nay, an honest man can do no good upon those that are wicked, to reclaim them, without the help of the knowledge of evil. Francis Bacon, Meditationes sacræ (1597), Book II, xxi, 9. Julien Benda, Treason of the Intellectuals, pp. 107-108. What has been shown by Machiavelli, who is often (like Nietzsche) congratulated for tearing off hypocritical masks, brutally revealing the truth, and so on, is not that men profess one thing and do another (although no doubt he shows this too) but that when they assume that the two ideals are compatible, or perhaps are even one and the same ideal, and do not allow this assumption to be questioned, they are guilty of bad faith (as the existentialists call it, or of “false consciousness,” to use a Marxist formula) which their actual behavior exhibits. Machiavelli calls the bluff not just of official morality—the hypocrisies of ordinary life—but of one of the foundations of the central Western philosophical tradition, the belief in the ultimate compatibility of all genuine values. His own withers are unwrung. He has made his choice. He seems wholly unworried by, indeed scarcely aware of, parting company with traditional Western morality. But Machiavelli also sets side by side with this the notion of Christian virtues – humility, acceptance of suffering, unworldliness, the hope of salvation in an afterlife – and he remarks that if, as he plainly himself favours, a State of a Roman type is to be established, these qualities will not promote it: those who live by the precepts of Christian morality are bound to be trampled on by the ruthless pursuit of power on the part of men who alone can re-create and dominate the republic which he wants to see. He does not condemn Christian virtues. He merely points out that the two moralities are incompatible, and he does not recognise an overarching criterion whereby we are enabled to decide the right life for men. The combination of virtù and Christian values is for him an impossibility. He simply leaves you to choose – he knows which he himself prefers. The idea that this planted in my mind was the realisation, which came as something of a shock, that not all the supreme values pursued by mankind now and in the past were necessarily compatible with one another. It undermined my earlier assumption, based on the philosophia perennis, that there could be no conflict between true ends, true answers to the central problems of life. Perhaps the most influential book ever written on the characteristics of men in politics is The Prince, by the great Renaissance Italian Nicolo Machiavelli (1469-1527). Despite its enduring popularity, fascination, and authority it is extremely one-sided and unsystematic. The cool cynicism of Machiavelli’s teaching is impressive. Not only does he recommend to princes absolute unscrupulousness; his advice is based on the assumption that all their subjects are gullible and guided solely by self-interest. Some have been shocked by the book’s immorality; others have found its lack of humbug refreshing. Few, however, have been persuaded to admire the models held up by Machiavelli, such as Pope Alexander VI and his son Cesare Borgia. There is really very little of Machiavelli's one can accept or use in the contemporary world. The one thing I find interesting in Machiavelli is his estimate of the prince's will. Interesting, but not such as to influence me. If you want to know who has influenced me most, I'll answer with two philosophers' names: Spinoza and Kant. Which makes it all the more peculiar that you choose to associate me with Machiavelli. Friedrich Nietzsche, "Twilight of the Idols"
It has been said that the project of Machiavelli was to expound a science of politics, but this, I think, misses the significant point. 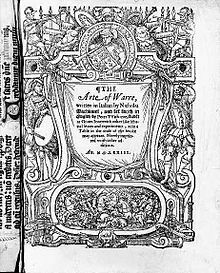 [...] The project of Machiavelli was, then, to provide a crib to politics, a political training in default of a political education, a technique for the ruler who had no tradition. He supplied a demand of his time; and he was personally and temperamentally interested in supplying the demand because he felt the 'fascination of what is difficult'. The new ruler was more interesting because he was far more likely than the educated hereditary ruler to get himself into a tricky situation and to need the help of advice. 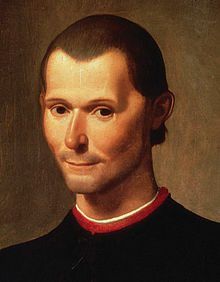 But, like the great progenitors of Rationalism in general (Bacon and Descartes), Machiavelli was aware of the limitations of technical knowledge; it was not Machiavelli himself, but his followers, who believed in the sovereignty of technique, who believed that government was nothing more than 'public administration' and could be learned from a book. And to the new prince he offered not only his book, but also, what would make up for the inevitable deficiencies of his book - himself: he never lost the sense that politics, after all, are diplomacy, not the application of a technique. Machiavelli was the first philosopher to define politics as treachery. This is not to say that he approved of treachery, only that he wished to describe politics as various forms of it. That he set out to do so, however, is no doubt why for almost five hundred years the single most influential of all modern political thinkers, as this biography hopes to show, has himself been described as revolting, nauseating, unprincipled and evil. Paul Oppenheimer, Machiavelli: A Life Beyond Ideology (2011), "Introduction: Modern Evil and The Sack of Rome"
It is this that Samuel insisted on to the Hebrews; it is this that Machiavelli clearly demonstrated. While pretending to give lessons to kings, he gave great ones to peoples. The Prince of Machiavelli is the book for republicans. Machiavelli was an honorable man and a good citizen; but, attached to the house of the Medici, he was forced, during the oppression of his country, to conceal his love for liberty. The mere choice of his execrable hero sufficiently manifests his secret intention; and the opposition between the maxims of his book the Prince and those of his Discourses on Titus Livius and his History of Florence shows that this profound politician has had hitherto only superficial or corrupt readers. The court of Rome has strictly prohibited his book; I certainly believe it, for it is that court which he most clearly depicts. This misfortune occurred to Machiavelli, who, had he been a Machiavellian, would sooner have written an edifying book than his ill-reputed Prince. 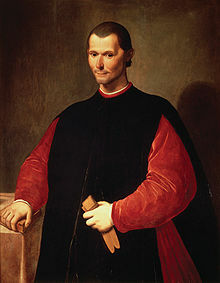 In actuality, Machiavelli was on the defensive as was also his country, Italy, which in the sixteenth century had been invaded by Germans, Frenchmen, Spaniards, and Turks. At the beginning of the nineteenth century the situation of the ideological defensive was repeated in Germany-during the revolutionary and Napoleonic invasions of the French. When it became important for the German people to defend themselves against an expanding enemy armed with a humanitarian ideology, Machiavelli was rehabilitated by Fichte and Hegel. In the case of a prince whose sole motive is lust for power, the means he must employ to strengthen and preserve his state have been described at some length by that keen observer, Machiavelli, but with what purpose appears uncertain. If he did have some good purpose in mind, as one should believe of so wise a man, it must have been to show how foolish are the attempts so often made to get rid of a tyrant while yet the causes that have made the prince a tyrant cannot be removed; on the contrary, they become more firmly established as the prince is given more grounds for fear. We shall not shock anyone, we shall merely expose ourselves to good-natured or at any rate harmless ridicule, if we profess ourselves inclined to the old­ fashioned and simple opinion according to which Machiavelli was a teacher of evil. Niccolò Machiavelli was the restorer of the Roman conception of politics as civil wisdom—that is, the idea of politics as the wisdom of the citizen whose aim is to preserve the civil life—and the founder of the theory of modern republicanism based pon this conception. He was a founder, but in a very different sense from the usual meaning of the word, and most of the pompous titles which have been attributed to him should be put aside, beginning with the least justified of all, that of founder of the modern science of politics. Maurizio Viroli, Machiavelli (1998), "Introduction"
The elements of Realpolitik, exhaustively listed, are these: The ruler's, and later the state's, interest provides the spring of action; the necessities of policy arise from the unregulated competition of states; calculation based on these necessities can discover the policies that will best serve a state's interests; success is the ultimate test of policy, and success is defined as preserving and strengthening the state . Ever since Machiavelli, interest and necessity — and raison d'état, the phrase that comprehends them-have remained the key concepts of Realpolitik. From Machiavelli through Meinecke and Morgenthau the elements of the approach and the reasoning remain constant. Machiavelli stands so clearly as the exponent of Realpolitik that one easily slips into thinking that he developed the closely associated idea of balance of power as well . Although he did not, his conviction that politics can be explained in its own terms established the ground on which balance-of-power theory can be built. If one desires to learn at one blow, to what degree of hideousness the fact can attain, viewed at the distance of centuries, let him look at Machiavelli. Machiavelli is not an evil genius, nor a demon, nor a miserable and cowardly writer; he is nothing but the fact. And he is not only the Italian fact; he is the European fact, the fact of the sixteenth century. He seems hideous, and so he is, in the presence of the moral idea of the nineteenth..
↑ Binet, Estienne (1629) (in French). Du Salut D'Origene. Paris: Sebastien Cramoisy. pp. 359-361. . Original French: On arrive à ce detestable poinct d'honneur, où arriva Machiauel sur la fin de sa vie: car il eut cette illusion peu deuant que rendre son esprit. II vit un tas de pauures gens, comme coquins, deschirez, affamez, contrefaits, fort mal en ordre, & en assez petit nombre, on luy dit que c'estoit ceux de Paradis, desquels il estoit ecrit: "Beati pauperes, quoniam ipsorum est regnum cælorum". Ceux-cy estans retirez, on fit paroistre vn nombre innombrable de personnages pleins de grauité & de majesté, on les voyoit comme un Senat, où on traitoit d'affaires d'estat, & fort serieuses, il entrevid Platon, Aristote, Seneque, Plutarque, Tacite, & d'autres de cette qualité. II demanda qui estoient ces Messieurs-là si venerables, on luy dit que c'estoient les damnez, & que c'estoient des ames reprouuées du Ciel, "Sapientia huius sæculi, inimica est Dei". Cela estant passé, on luy demanda desquels il vouloit estre. II respondit, qu'il aymoit beaucoup mieux estre en enfer auec ces grands esprits, pour deuiser auec eux des affaires d'Estat, que d'estre auec cette vermine de ces belistres qu'on luy auoit fait voir. ↑ Busini, Giovanni Battista; Gaetano Milanese (ed.) (1860) (in Italian). Lettere di Giovambattista Busini a Benedetto Varchi. Florence: Felice le Monnier. pp. 84-85. . Original Italian: Ammalato cominciò a pigliar di queste pillole, ed a indebolire ed aggravar nel male; onde raccontò quel tanto celebrato sogno a Filippo, a Francesco del Nero ed a Iacopo Nardi, e ad altri, e cosi si morì malissimo contento, burlando. ↑ Marvin, Frederic Rowland (1902). The Last Words (real and Traditional) of Distinguished Men and Women. Revell. p. 178.